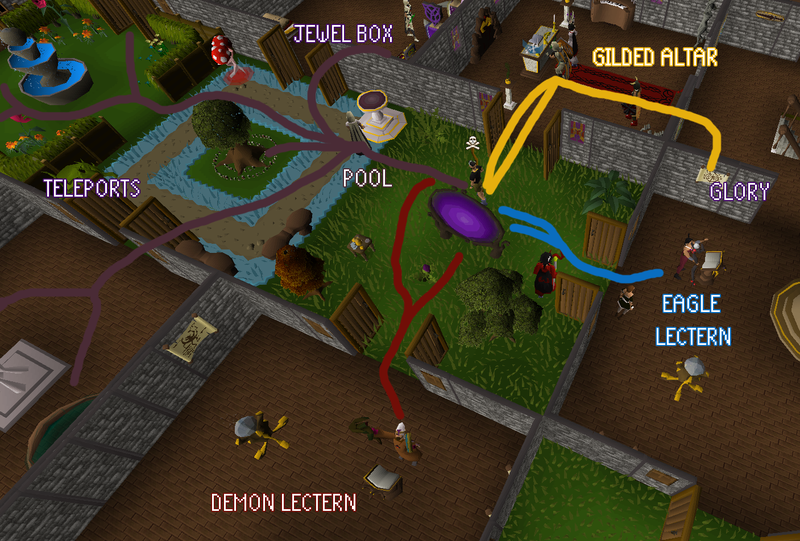 Unsure of what is involved with opening your house for the Gilded altar in World 330, Yanille or Rimmington? Worry no more, as we are here to help guide you through the process. For more immediate assistance, you are more than welcome to join "07 Altar" Clan Chat in-game, or Discord. Feel free to join us on our Discord server if you would like to engage with our community. You are able to join via a web browser by clicking here, so you do not have to download the Discord application!﻿ But if you wish to download the Discord application, click this link: https://discordapp.com/download. If you would like a guide that shows you how to use Discord, you can find it here. We now have a House Host Tracker that allows us to add and remove open hosts on the host list. This list is shown in a table format on our Portal page, Forums page, and on Discord. The tracker has Discord commands associated with it. For more information regarding those commands, feel free to read the guide here. They are built in the Chapel room which requires level 45 Construction and 50,000 coins. It is recommend to have the Chapel room north of your House portal , as a players' compass is north by default when they enter your house. In addition to that, they are the most used furniture. Gilded altars alone give 250% bonus XP in Prayer. They have 2 burners , one on each side. Each burner gives 50% bonus XP in Prayer if they are lit by a Tinderbox and Clean marrentills (purchasable from the Grand Exchange in Varrock) requiring level 30 Firemaking, so it is a total of 350% bonus XP in Prayer ! Lit burners last between 2 minutes 10 seconds and 4 minutes depending on the Firemaking level of who lit the burner , so try your best to keep them lit so that guests in your house don't lose XP. You have the option to relight them beforehand to be safe. You will need around 30-80 Clean Marrentills per hour while hosting, so you should bring a lot if you are planning on hosting for a long time. At level 50 Firemaking, a burner would last between 250 and 299 ticks (150-179 seconds). At level 85 Firemaking, a burner would last between 285 and 369 ticks (171-221 seconds). At level 99 Firemaking, a burner would last between 299 and 397 ticks (179-238 seconds). Tea made in your house by either your servant or yourself (provides +3 Construction boost with Teak Shelves 2 in your Kitchen ). Crystal Saw from The Eyes of Glouphrie quest (provides +3 Construction boost). Spicy Stews used with Orange spices from Recipe for Disaster: Freeing Evil Dave quest (provides -2 to +2 Construction boost per Orange Spice dose . The maximum amount of doses is 3, so it can range from -6 to +6 Construction boost). Tea + Crystal Saw = +4 to +6 Construction boost, and Crystal Saw + Spicy Stew = -2 to +8 Construction boost. As a result, level 66 Construction is the lowest you can have to get a Gilded altar , however the +6 boost from Spicy Stews is extremely rare. Before opening your house, you need to ensure that players can enter your house, even if they are not on your friends list. To do that, double check that your "Private" tab is set to "On". Big bones, which give 52.5 XP. Babydragon bones, which give 105 XP. Dragon bones, which give 252 XP. Lava dragon bones, which give 297.5 XP. Dagannoth bones, which give 437.5 XP. Superior dragon bones, which give 525 XP. Workshop (Level 15 Construction & 10,000 coins). Bedrooms (Level 20 Construction & 10,000 coins). Combat Room (Level 32 Construction & 25,000 coins). Quest Hall (Level 35 Construction & 25,000 coins). Study Rooms (Level 40 Construction & 50,000 coins). Portal Chambers (Level 50 Construction & 100,000 coins). Superior Garden (Level 65 Construction & 75,000 coins). Portal Nexus (Level 72 Construction & 200,000 coins). Achievement Gallery (Level 80 Construction & 200,000 coins). 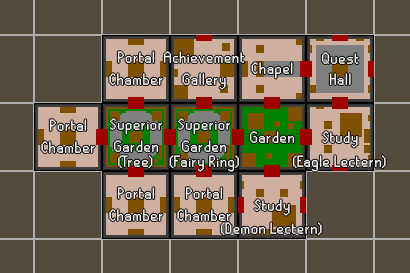 With the addition of the Portal Nexus, the above layout can be condensed. These layouts can be used as a guide. With your own personal touches, you can build a mansion! 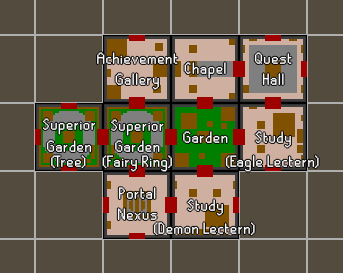 Oldschool.tools has a very useful House Layout Planner located here. It is used sometimes by your guests to repair armour, make flatpacks, craft items, or to paint items based on their Crest. It is recommended to have it no more than two rooms away from your House portal , so that guests do not have to walk too far. A Bench with lathe (Level 77 Construction. This makes all furniture flatpacks listed here. They are used sometimes by your guests when they want to change their shoe colour, hand, sleeve, leg, and torso type and colour. A Gilded Dresser (Level 74 Construction). This allows you to have the most options when it comes to changing your facial hair (males), hair colour and type for free. A Gilded Wardrobe (Level 87 Construction). This allows you to have the most options when it comes to changing your shoe colour, hand, sleeve, leg, and torso type and colour for free. 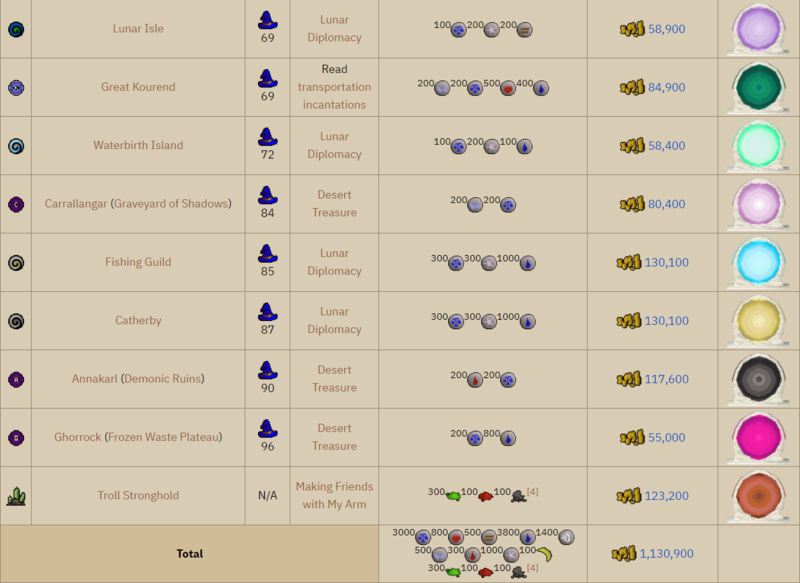 A Servant's moneybag (Level 58 Construction). This allows you to pay your servant indirectly, and therefore it will save you one inventory space . Note: Two bedrooms are required if you want to have a servant in your house. Only the bed is needed for both bedrooms . It is sometimes used by guests for fun or to attack the Combat dummy . The Combat dummy (Level 48 Construction) allows anyone to know what their maximum hit is based on their stat levels, and their weapon and gear bonuses. In addition to that, the special attack of an Ancient mace can be used on the Combat dummy if a player wants their Prayer points to go above their current Prayer level . An undead monster, provided that the player is wearing a Salve amulet . A Slayer assignment, provided that the player is wearing a Slayer helmet . A Demonic creature, allowing players to test their max hit with the Silverlight , Darklight , and Arclight . It is one of the most useful rooms when it comes to guests training Prayer at your house. The reason being is that you can make your own mounted amulet of Glory at level 47 Construction which has unlimited teleport charges. Some guests will like to teleport to the bank at Edgeville after using an inventory of bones on your Gilded altar for faster banking. It is recommended to have the Quest Hall east or west of your Chapel for ease of access to the mounted amulet of Glory . If the Quest Hall is west of your Chapel , the mounted amulet of Glory should be on the north eastern wall, so that it makes it easier for your guests to find it and click it due to the compass being north by default. They are used often by your guests to make tablets. It is recommended to have it right next to your House portal , so that guests can make tablets quickly and efficiently. There are two types of Lecterns: Mahogany Eagle lectern and Mahogany Demon lectern . The Mahogany Eagle lectern is for teleport tablets and so it is used more often, while the Mahogany Demon Lectern is mainly for enchantments and Bones to Peaches . Enchant sapphire (Level 7 Magic; 17.5 Magic XP). Varrock teleport (Level 25 Magic; 35 Magic XP). Falador teleport (Level 37 Magic; 48 Magic XP). Lumbridge teleport (Level 31 Magic; 41 Magic XP). Camelot teleport (Level 45 Magic; 55.5 Magic XP). Ardougne teleport (Level 51 Magic; 61 Magic XP). Watchtower teleport (Level 58 Magic; 68 Magic XP). Teleport to house (Level 40 Magic; 30 Magic XP). Enchant emerald (Level 27 Magic; 37 Magic XP). Enchant ruby (Level 49 Magic; 59 Magic XP). Enchant diamond (Level 57 Magic; 67 Magic XP). Enchant dragonstone (Level 68 Magic; 78 Magic XP). Enchant onyx (Level 87 Magic; 97 Magic XP). Bones to Bananas (Level 15 Magic; 25 Magic XP). Bones to Peaches (Level 60 Magic; 35.5 Magic XP). Magic levels can be boosted by using a Wizard's Mind Bomb , Magic Essence Potion , Mature Wizard's Mind Bomb (minimum of level 50 Magic ), Magic Potion , Imbued heart , or a Super Magic Potion . 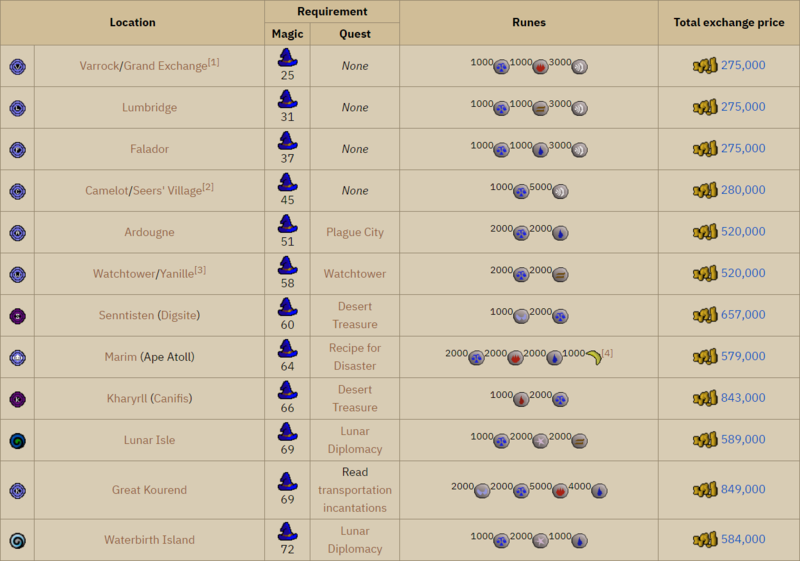 All of them can be purchased from the Grand Exchange in Varrock, except the Magic Essence Potion which was made in Fairytale II - Cure a Queen quest, and the Super Magic Potion which is purchasable from Nightmare zone for 250 reward points. Yanille (Watchtower; Level 58 Magic). Senntisten (Digsite; Level 60 Magic). Marim (Ape Atoll; Level 64 Magic). Kharyrll (Canifis; Level 66 Magic). Lunar Isle (Level 69 Magic). Great Kourend (Level 69 Magic). Waterbirth Island (Level 72 Magic). Fishing Guild (Level 85 Magic). Annakarl (Demonic Ruins; Level 90 Magic). Troll Stronghold (No Magic Requirement). Varrock, as the Grand Exchange teleport is available in the Jewellery Box . Falador, as the Falador Park teleport is available in the Jewellery Box . Senntisten, as it is hardly ever used. It has a level 60 Magic requirement and there are tablets available on the Grand Exchange, so guests have other options if they need to teleport there. 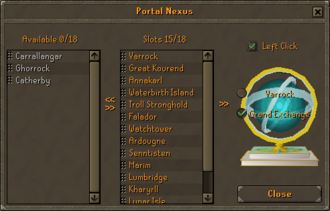 Note: Due to a new room being added (the Portal Nexus ), you no longer need to worry about omitting portals as you now have the ability to put multiple teleports in one room using the same hotspot. This allows you to have less unnecessary portal rooms in your house. Note: All portals require a portal frame, and that requires at least level 50 Construction. the Superior Garden is often often used for its' teleports and pool . It is recommended to place it east or west of the House portal . Spirit tree (Level 75 Construction & Level 83 Farming). Fairy ring (Level 85 Construction). Spirit tree & fairy ring (Level 95 Construction & Level 83 Farming). The obelisk allows players to teleport to a Wilderness Obelisk, but not vice versa. It will teleport the player to a random Wilderness Obelisk, unless they have completed the hard Wilderness Diary which will allow them to select the teleport destination. Level 83 Farming can be boosted by using a Cider (+1 Farming boost), Mature Cider (+2 Farming boost), or a Garden pie (+3 Farming boost). 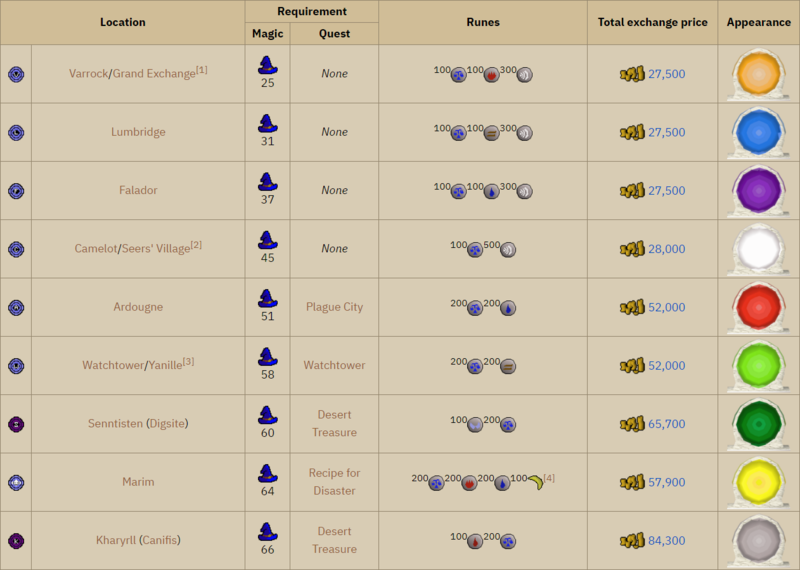 These items can be purchased from the Grand Exchange in Varrock. Note: Crystal Saw does not work when boosting Construction levels for a Spirit tree and/or a Fairy ring . However, Tea or Spicy Stews do work. But keep in mind that their boosts do not stack together. Restoration pool (Special attack energy). Level 65 Construction is required. Revitalisation pool (Previous + Run energy). Level 70 Construction is required. Rejuvenation pool (Previous + Prayer points). Level 80 Construction is required. 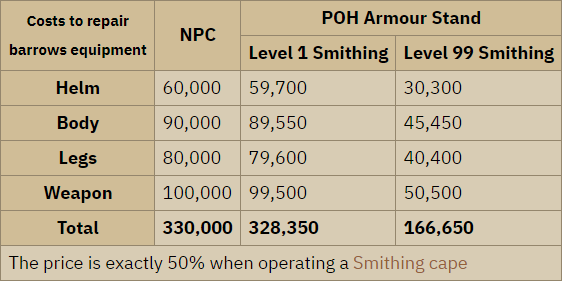 Fancy rejuvenation pool (Previous + Reduced stats). Level 85 Construction is required. Ornate rejuvenation pool (Previous + Hitpoints). Level 90 Construction is required. Note: None of the teleports can be boosted for the Portal Nexus . When you right click either jewellery, you can access the configuration menu and the teleport menu. North of the Digsite, west of the Digsite barge. Strange Machine at the House on the Hill, north of the Museum Camp in Fossil Island. This is unlocked by using the Digsite pendant on the strange machine upon completion of the Bone Voyage quest. Lithkren. 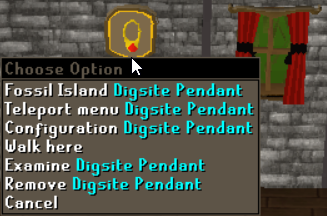 This is unlocked by using the Digsite pendant on the strange machinery north of the Rune dragons upon completion of the Dragon Slayer II quest. Xeric's Look out (Shayzien, south of the Infirmary). Xeric's Glade (Hosidius, by the magic trees north of Logava Gricoller's Cooking Supplies). Xeric's Inferno (Lovakengj, by the lovakite furnace south of the blast mine). Xeric's Heart (Kourend Castle, next to the statue. This is unlocked upon completion of Architectural Alliance miniquest. Xeric's Honour (Mount Quidamortem. This is unlocked upon using an Ancient tablet on the Xeric's talisman. 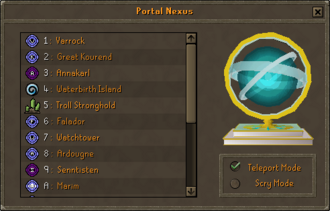 The Portal Nexus also has a configuration and teleport menu. 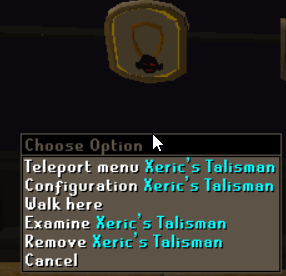 The configuration menu allows you to select which teleport should be a left click option, and which teleports are to be available for everyone to use. Teleports in a grey colour means you either do not have the correct Magic level and/or you do not have the required runes and items for the spell. Teleports in an orange colour means you can move it in the slots on the right hand side for everyone to use. The Achievement Gallery is often used for the spellbook altar and the jewellery box . It is recommended to place it one room north of the Superior Garden . Occult altar (all of the above). Basic jewellery box (Ring of Duelling and Games Necklace ). Level 81 Construction is required. Fancy jewellery box (Previous + Combat Bracelet and Skills Necklace ). Level 86 Construction is required. Ornate jewellery box (Previous + Amulet of Glory and Ring of Wealth ). Level 91 Construction is required. A servant is a NPC that can un-note items and place construction supplies in or out of your bank. With Clean marrentill in your inventory , you will be able to use it on your servant and ask him/her to un-note them. This is the best method for lighting, since you do not have to run to the bank. Keep in mind that the servant will ask for payment every 8 trips. To make life convenient, a Servant moneybag (Level 58 Construction) can be built in the Bedroom so that you do not have to waste one inventory space for coins when paying your servant . Note: Two bedrooms are required if you want to have a servant in your house. Only the bed is needed in both bedrooms . Falador, north of the White Knights' Castle. Seers' Village, north-east of the bank. East Ardougne, south-west of the marketplace. Great Kourend, south of the Mess hall in Hosidius House. Please avoid asking or begging for donations in your house. Guests generally dislike it and find it annoying or cringey. It may even result in less donations overall. Trolls are annoying players that purposely annoy the guests and/or yourself for their own pleasure. To get rid of them, put them on ignore list and then kick them from your house. Step 1: Click the "Clan Chat" tab at the bottom left of the interface as shown below. Once that is done, click the "Join Chat" button. Step 3: You have now joined our community chat! To talk, put a forward slash at the start of each sentence that you type. E.g. /Hi everyone! Invite your guests to join our community in "07 Altar" Clan Chat so that they can have an enjoyable experience whilst being able to find other houses in the future. Mention trolls that you have ignored and kicked from your house in "07 Altar" Clan Chat so that the other hosts can do the same.